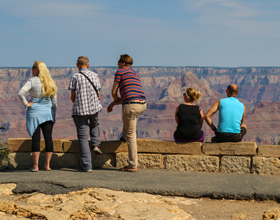 A trip to the Grand Canyon is the perfect way to make family memories. Our “Family Fun” itinerary has it all – beautiful sights, fun, adventure, excitement and the opportunity to learn about the history and ecology of one of the world’s greatest wonders. Junior Rangers help to preserve and protect national parks, while learning about nature and history, have fun exploring the parks, and tell their friends, families, and schoolmates about their adventures. Junior Rangers continue to protect the environment at home and at school. To become a Junior Ranger at the South Rim, pick up the Junior Ranger Activity Booklet at the Grand Canyon Visitor Center®, Park Headquarters, Tusayan Museum near Desert View, Kolb Studio or Yavapai Geology Museum. 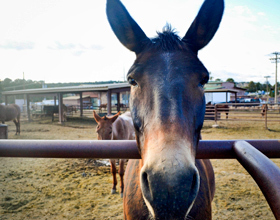 The Canyon Vistas Mule Ride is a three-hour, four-mile adventure led by mule wranglers who make stops at various points to discuss the area’s geology, history, culture and more. A shady, well-defined, paved trail approximately 13 miles in length, the Rim Trail is excellent walking for quiet views of the inner canyon and for visitors who desire an easy hike with minimal elevation change. In winter surfaces may be slippery or icy when snowy. Beware of lightning during summer thunderstorms. Leashed pets are permitted on the trail but not on park shuttle buses. Be sure to read up on hiking tips and ways to "hike smart" before you begin your hike. 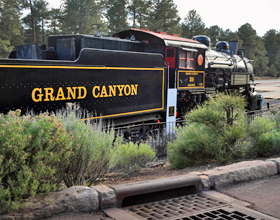 After a bus ride to Williams, Arizona, start your day by watching a recreation of an Old West gunfight at the Williams Train Depot before returning to the Grand Canyon by train, with musicians and cowboys to entertain you along the way. This tour is perfect for train enthusiasts and adventure lovers of every stripe. 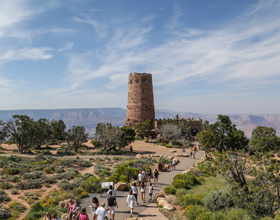 The Trail of Time is an interpretive walking timeline that focuses on Grand Canyon vistas and rocks and invites visitors to ponder, explore, and understand the magnitude of geologic time and the stories encoded by Grand Canyon rock layers and landscapes. 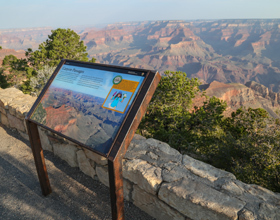 The exhibit follows the existing paved rim trail on the South Rim of Grand Canyon between Yavapai Observation Station and Grand Canyon Village and is marked by brass markers every meter, representing one million years of time. 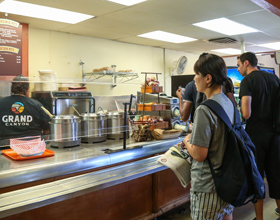 A visit to Hopi House combines retail shopping with museum quality artifact viewing. Here you will find a large selection of native arts and crafts available for purchase, such as hand-crafted kachinas, Native American jewelry, hand-woven Navajo rugs and authentic Native American pottery. The second-floor gallery, which reopened to the public in 1995, offers a variety of museum-quality items. 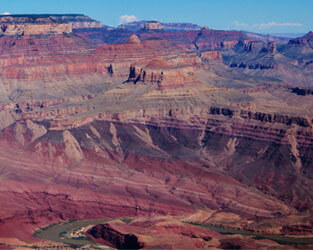 Hear about the Grand Canyon’s history, geology and wildlife from those who know it best – park rangers. There are programs for adults and kids. 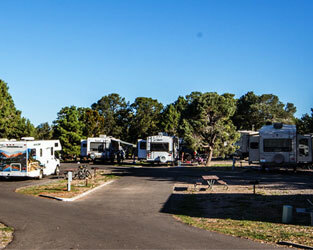 The Desert View area is a virtual requirement for visitors to the South Rim. 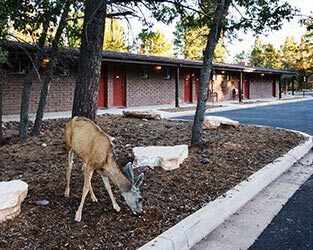 It offers some of the most spectacular views of the Grand Canyon, along with an all ages experience that combines history, art, architecture and Native American culture. 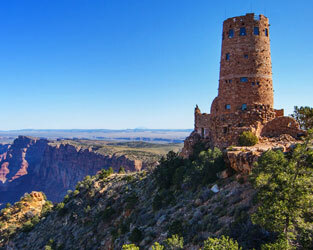 Modeled after ancient ancestral Puebloan watchtowers found in the Four Corners region, the Desert View Watchtower® is a unique example of Mary Colter's design style. 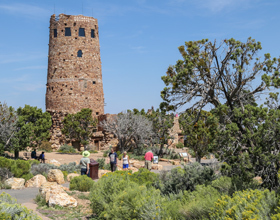 Built in 1932, the 70-foot tower is the highest point on the South Rim and offers stunning 360-degree views of the Painted Desert, the San Francisco Peaks, the Vermilion Cliffs, and beyond. You can climb the stairs all the way to enjoy these spectacular views. The walls of the tower feature murals by Hopi artist Frank Kabotie. 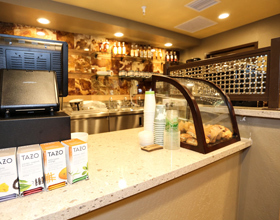 The Desert View Deli offers healthy, made-to-order menu items inspired by regional and Native American cuisine, as well as a selection of grab and go foods. 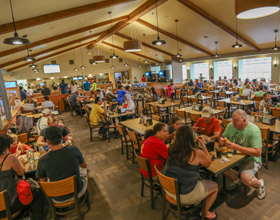 Choose from things like sandwiches, salads, southwestern chili and more. 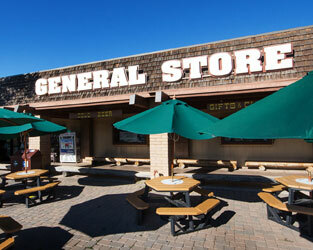 It's also a great place to pick up trail-ready snacks.